Recordings of the St Matthew Passion tend to be packaged as prestige items, but Channel Classics have gone a step further than most with this release. The slip case contains a 3-gate fold-out with the actual discs, each printed with with a painting of the last supper. There is also a hard-back book with the libretto and bios, which is copiously illustrated with religious art from down the years. The recording was made at the Museum Catharijneconvent, a convent converted into a museum of religious art, and it is being marketed as a collaboration with the museum, with all the illustrations coming from their collections. Fortunately, the quality of the performance and the recording lives up to the expectations that the packaging creates. It is one of those period instrument performances that finds an ideal balance between the intimacy of the small ensemble and the work's inherent drama. The soloists, both vocal and instrumental, all have the necessary charisma to pull off their various roles, but the mood remains plaintive throughout, and the solemn sense of occasion is never compromised by any virtuoso displays. The configuration of soloists and ensembles is complicated and very possibly unique. To briefly summarise the recent history of period performance of this work: Joshua Rifkin proposed in the early 80s that the work had originally been performed one to a part ie without any choirs. The idea was dismissed by most scholars until he produced irrefutable evidence to back his claim. There is a general feeling that in doing so, he spoiled the work for everybody. It now means that if you are going to use a choir of any size, you have to acknowledge that your performance is diverting from 'authentic' performance practice and give good reasons as to why that should be so. This, presumably, is the reason for conductor Jos van Veldhoven's liner essay 'A Single-Choir Passion? ', in which he explains the configuration used. His argument is that many of the choruses pre-date the Passion and were written for other vocal configurations, justifying (at least to some extent) the use of a single choir. The basic setup is two orchestras, positioned to the left and right of the audience (the recordings were made at live performances), a choir supporting the soloists, who together make up Coro I, and four soloists acting as Coro II. He also has a boys choir singing the repiano in the opening chorus, and it seems churlish to deny him that, especially when they sing so well. In fact, the whole setup, inauthentic as it may be, is more than justified by the results. It means that there are enough singers to cover all the parts, and that there is some drama in the more energetic passages. Drama but not weight. Everything about this recording is intimate and immediate. The absence of vibrato (apart from at one or two points from the higher soloists) suggests austerity, but Veldhoven makes the most of his lithe ensemble to introduce some rubato, occasionally subtle but also some grand gestures too. The way he slows up the endings of choruses might seem extreme but always seems appropriate in context. There are some interestingly distinctive voices among the soloists, but in general they all keep a fairly even tone to aid the unity of the whole. Gerd Türk articulates the role of the Evangelist with valuable clarity. His timbre in the upper register is a little strained, but that only adds to the discursive quality of is performance. Peter Harvey also gives a light performance as Christ, generally unemotional, but with the required presence to maintain the focus of the drama. Tim Mead, the alto, has more emotion and more timbral and dynamic variety than both. Some of his arias include some swoops between the higher notes that aren't to my taste, but nor do they stand out excessively. Amaryllis Dieltiens as the soprano is the only female voice among the (Coro I) soloists, so it is inevitable that she is going to stand out a little. In fact, the child-like quality of her voice fits very well. She has a fresh, open sound that complements the obbligato instruments beautifully. Her vibrato adds a touch of maturity to her performance, but while it is always controlled, it does seem excessive. I am listening to this recording in SACD stereo, which sounds very good, but it is one of the first times that I have felt the need for surround. According to a short note from Jared Sachs in the liner, he has arranged the surround sound so that Coro I is in the front channels and Coro II in the rear channels. What a great idea! I'd really love to know what that sounds like. In the stereo mix, we get Coro I in the left channel and Coro II in the right, but it is not as pedantic as that suggests and the choral sound in particular spreads out across the array. For an ecclesiastical setting, the acoustic is surprisingly dry. Not too excess, it still has warmth, but in general the style of the recording favours detail over atmosphere. 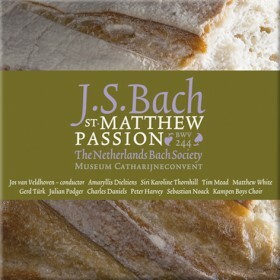 A distinctive Matthew Passion then, and one that sheds fresh light on much of the music. Despite the inclusion of a repiano choir and a boy's choir, this is still small-scale Bach. As such, it owes much to the spirit of Joshua Rifkin's research, if not his actual findings. Kudos to Channel Classics for their sumptuous production standards. Not only is the packaging beautiful, but the sound engineering is to a high standard and based on some very original thinking about the potential of high definition sound.